What's the cheapest rental available in Logan Square, right now? Logan Square is very walkable, is very bikeable and has good transit options, according to Walk Score's rating system. So what does the low-end pricing on a rental in Logan Square look like these days--and what might you get for the price? We took a look at local listings for studios and one-bedroom apartments in Logan Square via rental site Zumper to find out what budget-minded apartment seekers can expect to find in this Chicago neighborhood. Listed at $825/month, this 375-square-foot studio apartment, located at 1742 N. Humboldt Blvd., is 22.8 percent less than the $1,068/month median rent for a studio in Logan Square. Building amenities include on-site laundry, secured entry, outdoor space and extra storage space. In the apartment, expect hardwood floors, closet space and wooden cabinetry. Cats are welcome here. Here's a studio at 1850 N. Humboldt Blvd., which is going for $895/month. When it comes to building amenities, expect on-site laundry, secured entry and outdoor space. In the unit, you're promised air conditioning, hardwood flooring, a dishwasher and wooden cabinetry. If you've got a pet, you'll be happy to learn that cats and dogs are allowed. 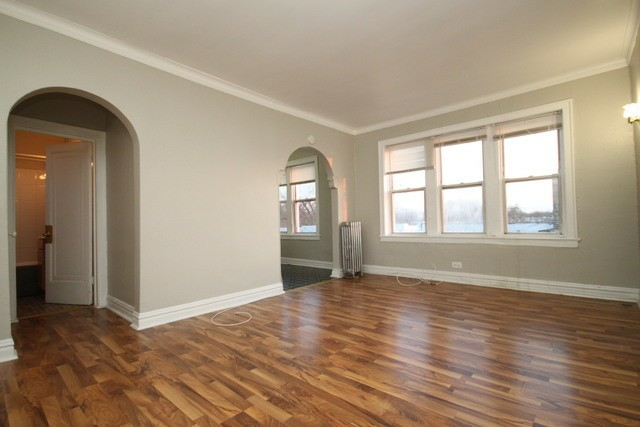 This studio apartment, situated at 3943 W. Diversey Ave., #212, is listed for $915/month. In the unit, anticipate both air conditioning and central heating, hardwood flooring and wooden cabinetry. Amenities offered in the building include on-site laundry. Pet owners, take heed: cats and dogs are permitted with additional fees, though restrictions apply. Listed at $950/month, this studio is located at 2779 N. Milwaukee Ave. Apartment amenities include hardwood floors, wooden cabinetry and a walk-in closet. When it comes to building amenities, expect an elevator, on-site laundry, secured entry and outdoor space. Pets are permitted on a case-by-case basis. To round things out, there's this studio apartment at 2781 N. Milwaukee Ave. It's also being listed for $950/month. The building offers on-site laundry, an elevator and on-site management. In the unit, expect to find a walk-in closet, high ceilings, hardwood floors and wooden cabinetry. Your cat is welcome here for additional fees.